Surprisingly, there are still companies out there that believe social media is an unnecessary tool in their marketing strategy and that it won’t drive sales. Just like you should have a website for your company, you should also be on social media. There are different social media platforms that your business may find more useful in alignment with your brand, but one of our favorites is Instagram. With 700 million users your brand is able to reach a large audience through visual communication and a strong strategy for content. Content Strategy: Because Instagram is a visual communicator, it’s important to have visually appealing content that aligns with your brand. The types of photos posted will be different for each brand depending on your key focus: products, lifestyle, culture, etc. Personally, we like having a mix, no matter what your business focus is – you want to make sure to build a relationship with your followers. So show the products or services you offer but also show the lifestyle one would obtain through your company’s products or services. Show the culture of your company in a professional manner so followers feel more connected to your brand. The key to successful social media is to be social with your followers on a digital platform; so make sure you’re engaging with your followers! Engagement: In our opinion, this is the most important. What’s the point of producing quality content if you’re not going to engage with the followers that are commenting on your photos? The beauty of social media is being able to humanize your brand so your customers build brand loyalty. They want to know there is someone behind the screen. If they have a question about your product or service, make sure to answer! If they leave a comment admiring your photo, respond and say thank you! If they have something negative to say, you still need to respond – the majority of the time, you simply will calm their anger, they just want their voice heard. Do not just engage on your personal page, venture onto other profiles and engage with those brands or people. Explore the hashtags you’re using and see what other people are posting using that same hashtag. Comment on their photos making sure your comments unique and personal! 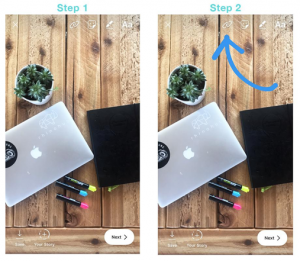 Instagram Stories: Instagram stories are a great way to stay in touch with your audience throughout the day. You want to keep your Instagram page looking cohesive and on brand, but with Instagram stories you can humanize your brand more. 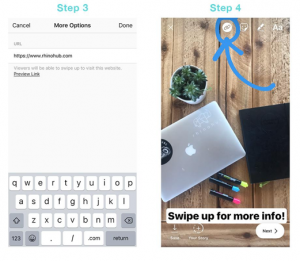 Instagram Stories are very popular as they allow you to tell a story and offer you a visual platform to build up hype on new products, events, announcements for new content, tutorials and more! When you have an event, instead of posting a dozen photos on your feed, you can update your followers on your Instagram story so they know what is going on and/or where to find you. 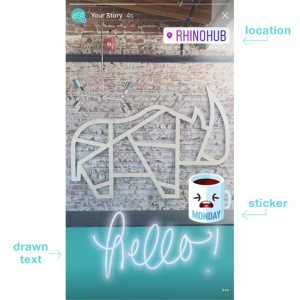 With Instagram stories, you can add photos or video, text, fun stickers, your location and more! 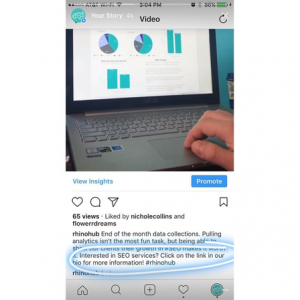 Advertising: It’s been an option to run promotions on Instagram for awhile, but one of Instagram’s recent updates allows you to insert ads into your Instagram Stories. Before this feature, the only way to direct people to your website from a non-paid Instagram post was to insert your call-to-action in an Instagram post and then direct them to your bio to click on the link. Step 3: Insert the link to the page you want your followers to land on. Step 4: If you want, add another call to action so they know to swipe up. Instagram is a fantastic tool that you should try to implement into your marketing strategy. If you’re using Instagram in your marketing strategy now, what are your favorite features? If you need help creating a social media marketing strategy, contact us today!